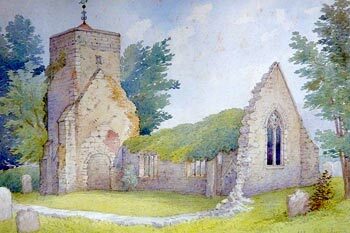 The Old St Helen’s Church is believed to be one of the oldest surviving buildings in Hastings. This and Hastings Castle are the only structures in the town from the 1066 period. Although the original church was constructed in the 11th century there have been many alterations since that time. The earliest remaining structure from the 11th century church is the west front of the nave with its circular blocked in windows, and parts of the north wall. The tower dates from the 12th century. The nave and chancel are roofless though much of the north wall survives. The east wall of the chancel contains the remains of a fine 14th century window. The remains of a canopied tomb dating to the 13th century can be seen on the inside north wall. The churchyard is of interest as it contains memorials from the 17th century to the mid 19th century, and has lain untouched since the church was partly dismantled in 1870 to provide building materials for the new St Helen’s Church on the Ridge. A number of the sandstone memorials are carved with symbols like the hour glass, angel’s head and palm leaves. The church is currently undergoing restoration as a result of a successful bid to the Heritage Lottery Fund. The building will remain fenced off until the building works are complete in the autumn of 2012 but the churchyard can be visited and the remains of the church can easily be viewed through the temporary fence.